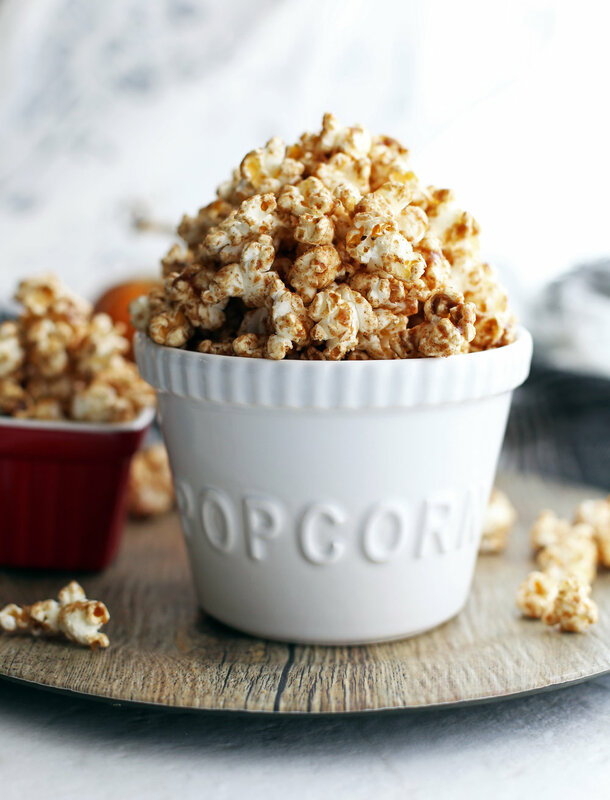 Answer: An absolutely addictive, tasty, snackable sweet and warmly spiced popcorn! Plus, this recipe only takes about 15 minutes to prepare from scratch before crisping it up in the oven to create satisfying crunchy popcorn. Years ago, we inherited an old popcorn popper from my mother-in-law. The thing has got to be over 30 years, but it still works like a charm; I love those purchases that keep on giving. One of the best things about homemade popcorn is the quantity of snack you can get out of such a small amount of kernels. It also provides the perfect medium for experimenting with flavour combinations. Seeing as how fall is right around the corner, I'm feeling a pumpkin spice vibe. My homemade pumpkin spice mix (or pumpkin pie spice mix if you prefer) uses cinnamon, ginger, nutmeg, and allspice, but many recipes use cloves as well or in place of the allspice. Feel free to substitute the allspice with an equal amount of clove if you have that in your pantry. All the spices have distinct flavours, but are complementary since they have a sweet and spicy flavour profile. They all work together to warm your body (and soul). All the ingredients for the popcorn! Amounts listed in the "Ingredients" list below. This butterscotch sauce takes a few minutes to make. The pumpkin spice is mixed in too. 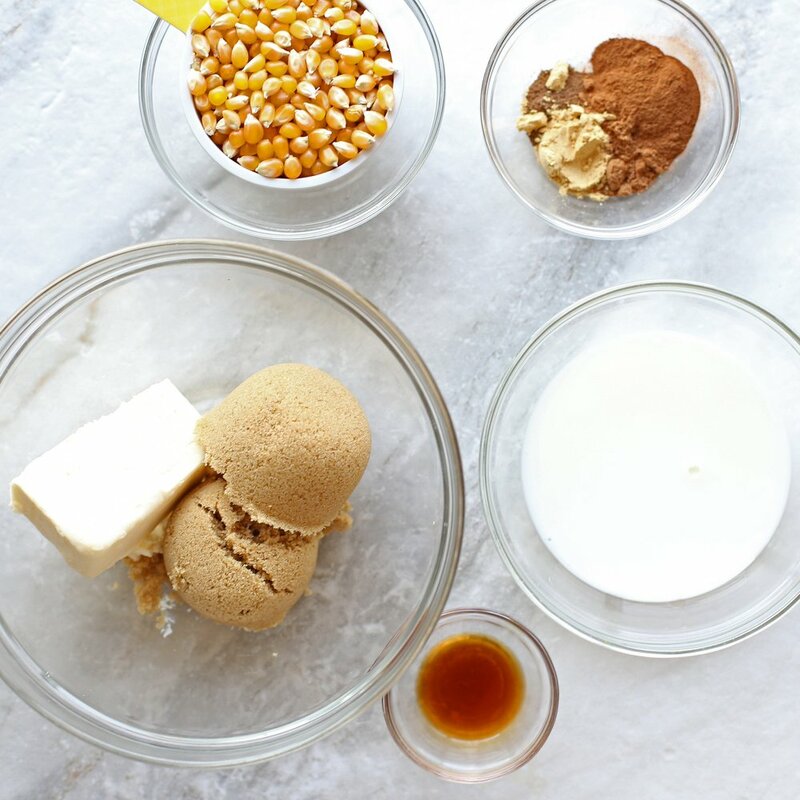 The butterscotch sauce, which is sweet, caramel flavoured goodness is made with five ingredients that are available in most grocery stores or that you already have in your kitchen pantry or refrigerator. 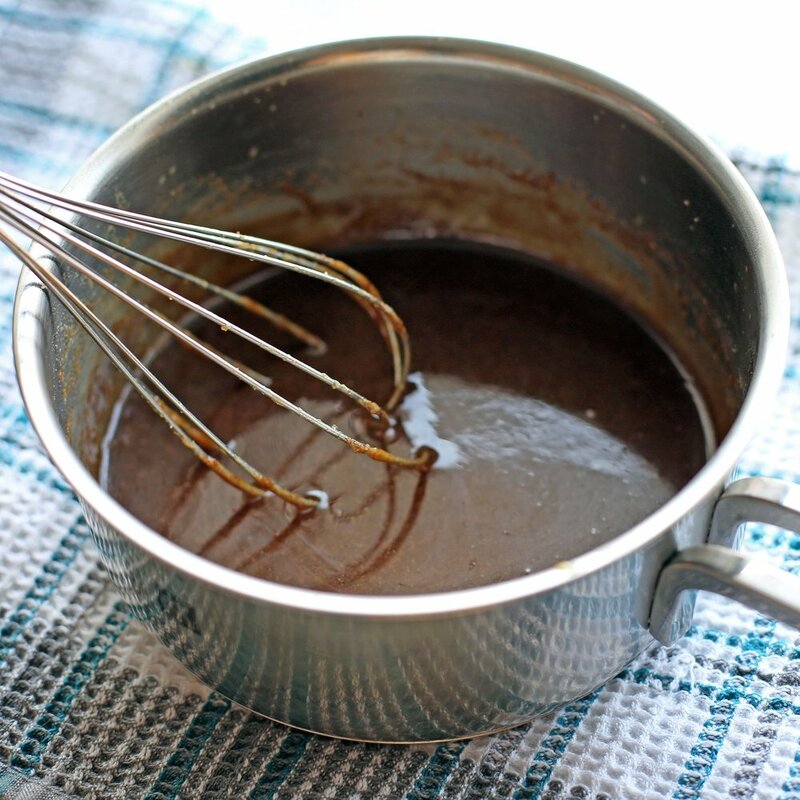 I enjoy this method of preparing the butterscotch sauce because it’s really easy and fast. It just requires you to stir the ingredients into a saucepan for a few minutes until it thickens. Then you add the vanilla extract, salt, and spices at the end, and you have a really delectable sauce that's perfect for the fall season! I suddenly have an urge to put on my favourite cozy scarf, some clunky boots, and enjoy the colourful falling leaves outside... it’s still summer weather here, but I can imagine for now. Anyway, the yummy sauce coats each piece of popcorn getting into the little crevices before baking, which makes each crunchy bite full of delicious flavour that will satisfy those with a sweet tooth. Perfect for snacking while you watch one of your favourite shows or movies. Does anyone else like watching Food Network while eating food and then critiquing/drooling over the food that you see on TV? This recipe is easily scalable, so you can make as much or little popcorn you would like! I hope you enjoy this recipe! Using a popcorn maker, pop the popcorn kernels into a large bowl, making 10 cups of popcorn. In a small bowl, combine the pumpkin spice ingredients together. Set both bowls aside. In a medium saucepan over medium heat, add the butter, brown sugar, and milk (in that order). Whisk continuously, until the butter melts completely and the sauce begins to bubble and thicken, about 3-4 minutes. Reduce the heat if the sauce bubbles up too much; it should be a gentle boil. Remove the saucepan from the heat and stir in the vanilla extract, salt, and pumpkin spice mix, until well combined. The sauce will be thickened, but easily pourable, and dark brown in colour. Pour the warm sauce over the popcorn. Using a spatula, gently toss to evenly coat the popcorn with the sauce. Preheat the oven to 250 degrees F. On a large baking sheet or two, spread the popcorn into an even layer and then bake in the oven for 40 minutes, flipping the popcorn halfway through. Enjoy! *½ cup of unpopped popcorn kernels makes around 10 cups of popped popcorn. Sauce will thicken as it cools so pour over the popcorn when it is still warm. Best served right away or same day. Store popcorn in an airtight container. Calories are based on one cup servings.